There are some good parts in the film, but it's not worth sitting through the rest of the movie to see them. "The Beverly Hillbilles" is a disappointment for two reasons: (a), it comes from Penelope Spheeris, who brought us the funny "Wayne's World," and (b), it fails miserably at catching the charm of the television show. Yet with all the negative points of the film, it still manages to come of silly in its own way; it's a bad movie, but not a particularly harmful one, on the other hand. 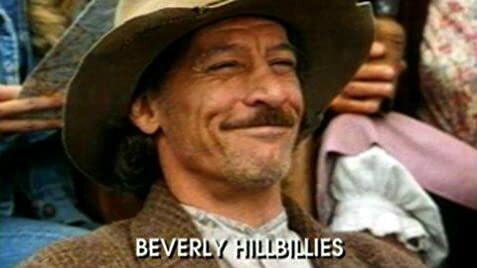 The late Jim Varney plays Jed Clampett, who--as all we all know--discovers some oil out in Arkansas, becomes a millionaire, and moves his family out to Beverly Hills, California. This is the excuse for some half-brained and ultimately stupid gags that sometimes become so bad it's hard to watch, yet make up for themselves when the film starts to make fun of itself. Jim Varney fits Jed pretty well, but too many of the actors and actresses seem forced and the dialogue is reminiscent of a straight-to-television flick written by authors with Writer's Block. Too much of the film borrows from other films we've seen before--and the gags have been done in those films about ten times better. The cast is top-o'-the-notch, co-starring the likes of Lea Thompson, Cloris Leachmen, Dolly Parton, Rob Schneider, Dabney Coleman, and even the real Buddy Ebson in a cameo. But a cameo by Buddy Ebson cannot save a badly written film. There really is no excuse for why this film was so bad. It had a good director, an overall good cast, a good script-writer, some good cameos, and good potential for some parody. But instead it comes off dull, recycled and misused, and ultimately a rehash of everything we've seen before, done in a childish and cartoonish way. So, yes, there are some good parts in the film, but it's not worth sitting through the rest of the film to see them. At the birthday party, the license plate number on the car in front of Jethro's truck is 2GAT123. That plate has been seen in various movies and television shows over the years, including: Beverly Hills Cop II (1987), Go (1999), Pay It Forward (2000), Mulholland Drive (2001), Curb Your Enthusiasm (2000), Two and a Half Men (2003), Modern Family (2009), and The Boy Next Door (2015). During the scene where the whole family is first driving into Beverly Hills, in the scene where they wave hello, the camera crew can be seen in the reflection of some of the cars. The orangutan used in this film is a captive-born animal. He belongs to a highly endangered species protected by international laws and treaties.